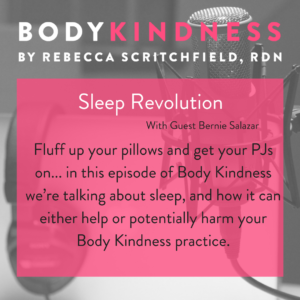 Fluff up your pillows and get your PJs on.. in today’s episode of Body Kindness we’re talking about sleep, and how it can either help or potentially harm your Body Kindness practice. We started out by sharing our Sleep Confessions! Bernie says he’s only managing about 4 hours a night with his new baby. When he does get to bed he often finds himself staring at the baby monitor, so he says he needs more meaningful shut-eye. Bernie says he unwinds by watching TV on his mobile late at night – it’s his Me time. He sometimes makes the moment extra rewarding by snacking. After a poor night’s sleep he says he feels unwell the next day, has increased sugar cravings and tends to make poorer choices. I pointed out that if he’d just gone to sleep he would have given his body the reward it really needed. Choosing not to sleep leads to other choices with short term rewards, but a consequence of feeling rough the next day. Also, the light on our phones suppresses the secretion of sleep hormone melatonin, which can lead to a poor night’s sleep. What happens when we get bad sleep? As part of the #Sleep8 challenge we’ve read Arianna Huffington’s book Sleep Revolution, which has great research on this. It doesn’t take much poor sleep to create a problem biologically. If you’re getting around 5-6 hours your body doesn’t get to do all the things it needs to do in the sleep window, like restore your energy levels, clean up the toxic sludge in your brain, and let your body and brain recover. Ideally the body needs five 90 minute sleep cycles (each moving through lighter to deep sleep). Bernie said his mind is often racing at bedtime. His doctor once gave him great advice – “You can’t solve a problem from your bed so you may as well get some sleep!”. I keep a notepad beside my bed, so I can write down anything that’s bothering me. I feel better that I’ve captured it, and I can deal with it in the morning. There are also hormonal triggers. When you are tired your body is looking for quick energy, which is found in sugar. It’s also more stressed, so it wants to calm down by creating serotonin which is released when you eat carbohydrate. So you won’t be craving healthy, slow release carbohydrates that are rich in nutrition. 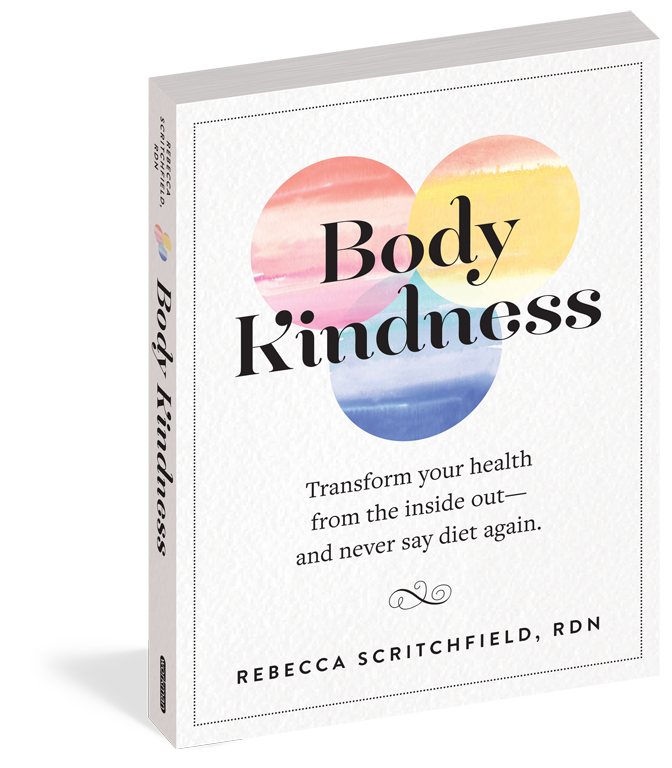 While Body Kindness means we don’t demonize any foods including sugar, it’s important to compassionately ask why we are craving them. Acting on these cravings can trigger guilt and blaming yourself for making a poor choice. But it’s really not about the food. It’s the lack of sleep that needs to be fixed. Being well rested helps you make calm, rational decisions and gives you the energy to think about your food choices and decide what you would really enjoy and what would nourish your body. The other hormonal impact is leptin (the satiety hormone) and ghrelin (the “hunger” hormone) levels. Hormones are released at certain stage of sleep. When this time is shortchanged your body hasn’t had enough time to get the right balance, so you wake up with more ghrelin and less leptin. As little as one night of disrupted sleep can disrupt these hormonal balances. If you listen to your body the next day, you can make choices to aid better sleep the next night. However if it you’re habitually shortchanging your sleep it can have an impact on your weight and food choices. Studies have shown lack of sleep can have a similar effect on the brain as being drunk. It’s good to be aware of this – if we wouldn’t drink regularly and expect to function, so likewise we shouldn’t expect to miss sleep regularly and be able to function. That said, alcohol can inhibit the quality of your sleep too – so look for other calming ways to unwind like deep breathing or restorative yoga. Bernie asked if there are any foods that aid sleep. I said you don’t want to eat in the hope it will help you fall asleep – make sure you truly feel hunger. Really consider if you need nourishment or if you just need to go to sleep. If you do, make it very small snack and something that gives you carbohydrate and is naturally higher in melatonin, like tart cherries or walnuts. This will help your body release its own melatonin. Magnesium and calcium are also important nutrients. How do you bounce back from a poor night’s sleep? Your mindset is the most important thing. Recognize why good sleep is important to you – for example, you’re happier and you make better decisions. Once you’ve got your why, you can take action. You have control of your choices. Make sure you hydrate – this helps with your energy levels. 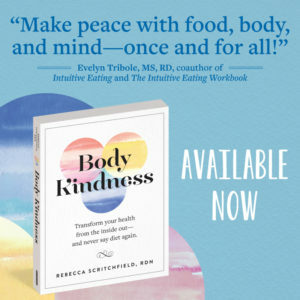 Pay attention to your cravings – it could be your hormones are off, and not that you really want to enjoy that comfort food. Learn the difference. Choose foods that energize you and make you feel better, not worse. Be committed if you had scheduled a workout – you may not feel like it but it can be a great act of Body Kindness to do it anyway – you’ll feel better and sleep better. Avoid self-sabotage or black and white thinking. Have self compassion – how can you respond to this situation? 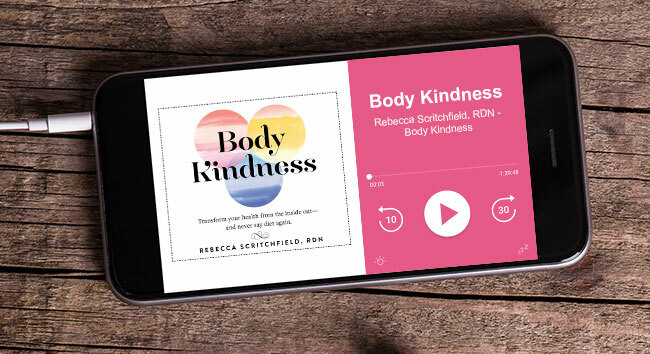 You have the choice to practice Body Kindness. Need help getting off to sleep? There are free videos on YouTube for night yoga, calming sounds and meditations.